Primary WRITE Preceptor: Curtis Mortenson, M.D. Dr. Curtis Mortenson is a 2001 graduate of Kodiak High School and has returned to his hometown after completing his family medicine residency in Anchorage. 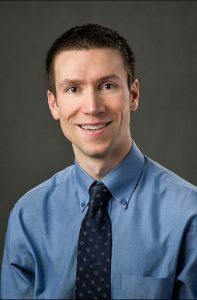 Dr. Mortenson has consistently been recognized for his passion for supporting both his patients and his colleagues, having been awarded the “Ideal Physician” award by his peers at Northeastern Ohio Universities College of Medicine and the “Janette Hermiston Award” after his first year of residency for his passion for learning and patient care. At the conclusion of residency, he was awarded the “Society of the Teachers of Family Medicine Award,” recognized by the faculty for his passion for teaching. Dr. Mortenson, a board certified family medicine physician, serves the Kodiak community through his work in the community health center and the emergency room. His primary medical interests include population health management, minor surgical procedures, and obstetrics. Stephen Bernside, M.D. • Carol Juergens, M.D. Providence Health Systems of Alaska operates Providence Kodiak Island Medical Center under a lease-management agreement with the Kodiak Island Borough as a critical access hospital. It is accredited by the Joint Commission on Accreditation of Healthcare Organizations (JACHO). The Medical Center features 25 acute care beds, including 4 birthing suites and 4 psychiatric care beds. It includes a significant range of inpatient and outpatient services including emergency department, surgery, maternity, general medicine, physical therapy specialty clinics, diagnostics, retail pharmacy and home health care. The Outpatient Specialty Clinic provides additional support services that include pediatrics, obstetrics, cardiology, urology, chronic pain and ear, nose and throat specialists. Community health care providers include physicians, chiropractors, dentists, optometrists, pharmacists, registered nurses, public health care nurses, physician assistants, respiratory, speech and physical therapists. Weather changes fast on this island, and the seasoned visitors know to leave an extra day or two in their plans as they could likely be fogged in during the summer months. 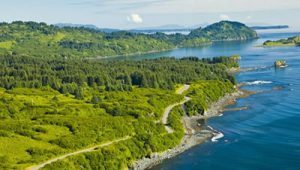 By airplane from Anchorage, it is approximately a 1- hour flight to Kodiak Island. Service is available on Alaska Airlines. Schedules vary ranging from four to eight flights a day depending on the season. By the Tusty: The Alaska Marine Highway System provides passenger and vehicle service to Kodiak and Port Lions from either Seward or Homer. Staterooms and a full-service dining room are available. Reservations should be made well in advance especially if you are bringing a vehicle. Housing: Housing in Kodiak is attached to the clinic. No pets allowed please. 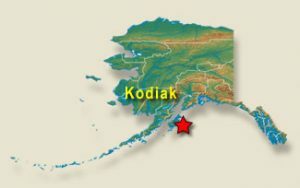 The Kodiak Island Group lies at the western border of the Gulf of Alaska. The group has an area of about 4,900 square miles and extends for a distance of around 177 miles in a northeast-southwest direction. Its greatest width is 67 miles and the deep bays of the coastline leave no spot on the island more than 15 miles from the ocean. Kodiak Island proper has an area of 3,588 square miles. There are numerous mountains that rise above 3,000 feet. 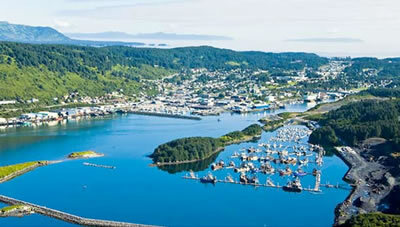 The climate of Kodiak Island is comparatively mild, much warmer than that of island areas of similar latitude. The difference is Kodiak lies in the path of the Japan current which sweeps northeastward along the coast of the Alaskan peninsula into the Gulf of Alaska. This same warm current gives California its warm weather.